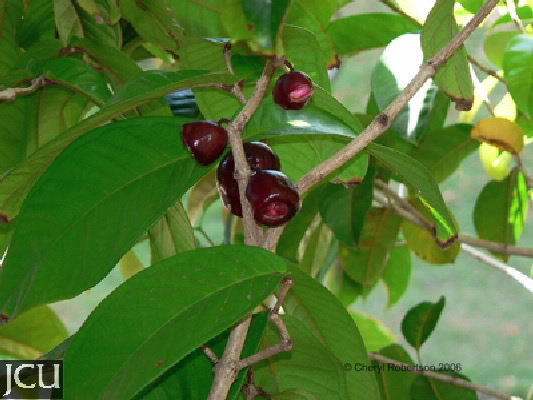 This rainforest tree is readily identified by the large leaves to 30 x 11 cm, which have dark pink to red veins, twigs also dark pink. The leaf base is weakly heart-shaped and appears to clasp the twig, new leaves pink. Flowers borne on trunk and branches, the red hypanthium contrasts with the white stamens. The large fruit are usually a dark red colour. A tree can be found near the steps to DB 34. Ants from the genus Iridomyrmex often inhabit bumps on twigs and trunk.